Each year, around October or November, there generally, with little or no hesitation, comes a political thriller with teeth-gnashing tension and historical moxie. Generally, George Clooney spins out one of the aforementioned movies and the Academy Awards salivate over them like an old bulldog attached to a ham bone. There is a certain gravitas to these pictures. Here, the dapper Clooney isn’t at the helm – he’s producing, but his fingerprints are nowhere near the wheel – and instead Ben Affleck finds himself navigating the waters of award season. Unlike some of the dense, foreboding, gritty thrillers that have dealt with similar issues, Argo is accessible to just about every audience – sometimes this can be good and sometimes this can be bad. Affleck does snow angels in cliches in order to ingratiate his audience, but, more often than not, it doesn’t detract from the suspense of his film. Argo takes place during the 1979 Iran hostage crisis where, after the overthrow of a U.S. embassy in Tehran, over fifty Americans were held in captivity while six more escaped into the belly of of Iran with only a Canadian couple to assist them (every American had a Wade Boggs mustache back then). As the gaudy, zinger-laden trailer suggests, the United States send in its specialist, Tony Mendez (Ben Affleck), to rescue the six lost buoys in a sea of volatile Iranians. The Central Intelligence Agency begrudging adopts an idea where Mendez puts together a motley crew of Hollywood talent in order to convince Iran they are interested in filming in their country; this, of course, with the goal of bringing the six Americans back home from a hostile and incensed environment. Argo’s impetus, surely, is to crown a relatively unknown story with the notoriety it deserves. In the process, Affleck needles the audience with thumping music and deadpan one-liners. Lester Siegel (Alan Arkin), an industry veteran who helps Mendez, is crotchety, short-fused and riveted with snarky comebacks. To his side is make-up artist John Chambers (John Goodman), a portly, recklessly sarcastic whiskey imbiber. The duo amble around, making sardonic comments, while, in as much feigned enthusiasm as they can gather, push their fake film to the press. Arkin and Goodman are the hoarse, emotionally bruised, viper-tongued centerpieces of Affleck’s opus. While the acting pops, the beams that reinforce the picture are the direction and set design. Everything from the large wingspans of collared shirts to the finishes on wood desks look lived in and era appropriate. Nothing here looks borrowed from the prop department of a community playhouse. The murky, unfiltered yellows and grays also give the film a pulpy authenticity. Ben Affleck plays Mendez with a calm rectitude. The enigmatic agent is like a bleeding shadow. Speaking in baritone and authoritative strokes, Affleck fleshes out a man that had an iron moral compass. This is one of the Boston born actor’s most restrained, calculated performances to date. And while he tries to iron out some of the movie with hokey cliches behind the camera, he still manages to both successfully direct and act in a movie that some may have thought was outside of his wheelhouse. Argo is both smart and entertaining without being insulting to its audience – something most films are unable to bridge. It isn’t the best picture of the year by any means, but it’s one of the most frequently interesting and well crafted. 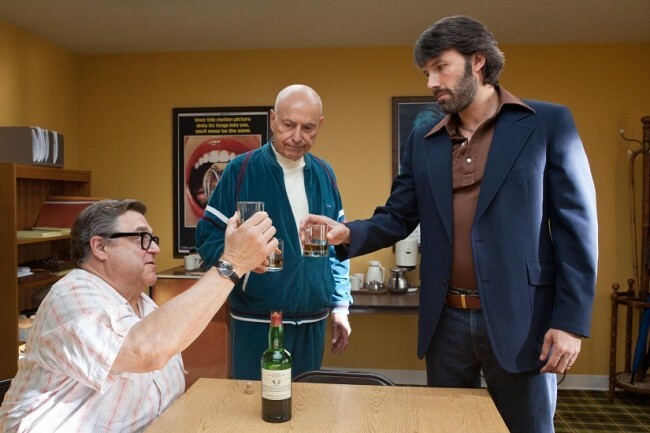 Worth seeing alone for the 1988 John Ritter beard that Ben Affleck dons, Argo is a worthy addition of Affleck’s oeuvre.